In Iran, women can be imprisoned for attending a volleyball match. In Dubai, a woman can be arrested for being raped. In Kenya, women have been assaulted in the street for wearing miniskirts. In Afghanistan, hundreds of women have been arrested for ‘moral crimes,’ such as fleeing forced marriages and domestic abuse. In Colombia, women have been threatened, attacked, and murdered for speaking out against injustice. In many parts of the world, from Sudan to Malaysia, a woman can be imprisoned, beaten and tortured for marrying outside her faith. 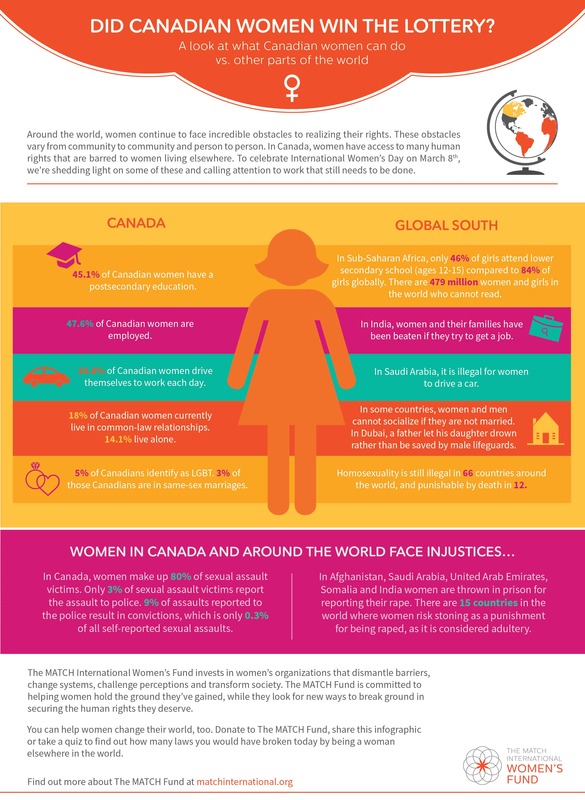 Around the world, including Canada, women continue to face incredible obstacles to realizing their rights. These obstacles vary from community to community and from person to person. We’ve come a long way, but we still have a long way to go, particularly on the international level. On International Women’s Day, it’s so important to recognize the work of women who risk their lives and safety to dismantle barriers, challenge perceptions, and, ultimately, transform society for a more equal world. The MATCH International Women’s Fund is raising awareness about the issues and struggles women face daily. They work with innovative, women-led partners spanning the world, from Argentina to Sri Lanka, in order to advance women’s rights where they live. You can learn more about The MATCH Fund here.